This weekend I had the incredible honor of having actress Helen Slater – famously starring in films such as Supergirl, Ruthless People, The Secret of My Success, City Slickers, and currently starring in The Lying Game – join me as a guest reviewer for Ma’amCakes. Helen and I decided to check out Vivian’s Millennium Cafe located on Ventura Boulevard in Studio City, CA. Not only was I anticipating this review because Helen is a very talented actress, with such a diverse acting – and singing – resume, but mostly because the last time I saw Helen, I was a flower girl in her wedding! Yes folks, Helen and I are cousins. 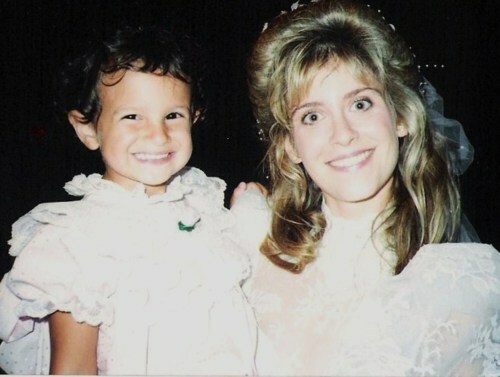 And somehow we have not seen each other since I was three years old! What better than a family reunion over Sunday Ma’amCakes?! After taking at least a half hour to catch up, when finally checking out the menu, we simultaneously announced to the server “I’ll have the Ultimate Pancakes, please.” Can you tell we’re related?? 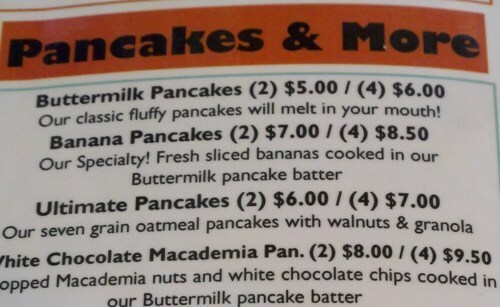 Apparently the most popular pancakes on the menu are the Banana Pancakes & the Ultimate Pancakes. As Helen and I were both hungry, we were sure to order the 2+2+2 combo, and substituted the buttermilk pancakes for the specialty pancakes. Brownie – er, pancake – points for Vivian’s for having this newly popular 2+2+2 option on their menu. Based off the menu, to be honest: I’m not much of an oatmeal eater, don’t like macadamia nuts, I’ve been eating too many banana pancakes lately, and yet I wanted to try something different. Well the Ultimate Pancakes at Vivian’s Millennium hit the spot perfectly! Now, a seven grain oatmeal pancake with walnuts and granola could instantly transport you back to Woodstock, if not cooked properly. But I must say, this concoction was cooked perfectly, and properly combined all ingredients – this is not easy to do. Hats off to the chef. Helen very much agreed with the tastiness of this pancake as she said, “Oh wow, I like these. They are a little heavy and chewy, but they’re definitely good.” One interesting point Helen made was “They feel very healthy – can’t believe I’m saying that about pancakes!” I bet if you placed the pancake on your face, it would cleanse your pores and sooth your skin – spas do use the same ingredients! The healthiness of the pancake is most certainly related to the seven grains, oatmeal, and granola – with hardly any butter at all. In fact, my only critique of the pancakes was their dryness; I had to constantly pour syrup on them. While it’s vital the pancakes don’t taste like they were first run through a butter churn, they also can’t taste like a day in the desert either. Overall, the Ultimate Pancakes at Vivian’s were very good, and certainly nothing like I’ve previously tasted. As Helen stated, “I really like the texture of the grain,” I nodded while enjoying my breakfast. Next time Helen and I go to Vivian’s, we both want to try the Banana Pancakes. Surprised?? Thank you so much Helen, for being a part of Sunday brunch with Ma’amCakes! And be sure to check out Helen’s latest album, Shine, now available on her website.